Singapore is located in southeastern Asia. Singapore is bordered by Malaysia to the north, and the Singapore Strait. Google Earth is a free program from Google that allows you to explore satellite images showing the cities and landscapes of Singapore and all of Asia in fantastic detail. It works on your desktop computer, tablet, or mobile phone. The images in many areas are detailed enough that you can see houses, vehicles and even people on a city street. Google Earth is free and easy-to-use. Singapore is one of nearly 200 countries illustrated on our Blue Ocean Laminated Map of the World. This map shows a combination of political and physical features. It includes country boundaries, major cities, major mountains in shaded relief, ocean depth in blue color gradient, along with many other features. This is a great map for students, schools, offices and anywhere that a nice map of the world is needed for education, display or decor. 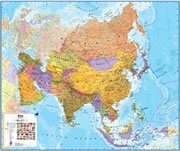 If you are interested in Singapore and the geography of Asia our large laminated map of Asia might be just what you need. It is a large political map of Asia that also shows many of the continent's physical features in color or shaded relief. Major lakes, rivers,cities, roads, country boundaries, coastlines and surrounding islands are all shown on the map. Ang Mo Kio, Bedok, Bishan, Boon Lay, Bukit Timah, Changi, Choa Chu Kang, Chong Pang, Clementi, Dampong Salabin, Geylang, Jurong East, Jurong West, Katong, Kranji, Lam San, Namazie Estate, Nee Soon, Pasir Panjang, Paya Lebar, Punggol, Queens Town, Sarangoon New Town, Sembawang, Singapore, Somapah Shangi, Tambines, Telok Blangah, Toe Payoh, Tuas, Woodlands and Yishun. 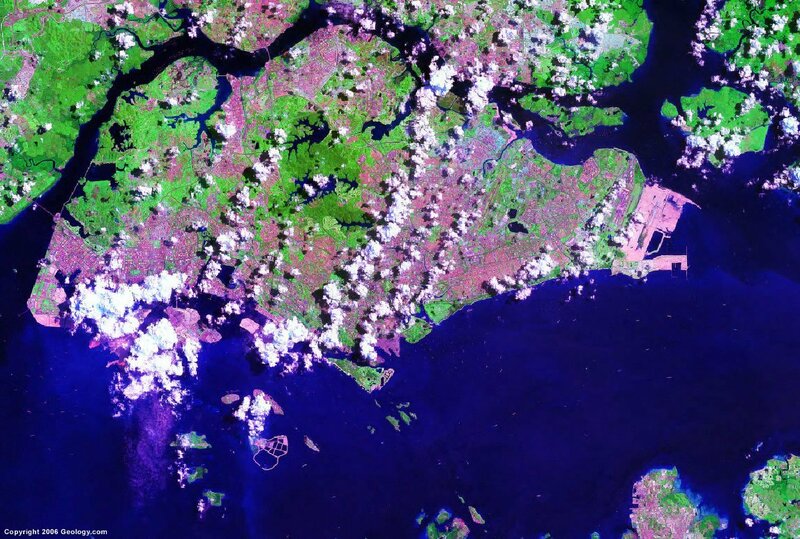 Bedok Reservoir, Kranji Reservoir, MacRitchie Reservoir, Main Strait, Murai Reservoir, Peirce Reservoir, Poyan Reservoir, Pulau Ayer Merbau, Pulau Brani, Pulau Bukum Kechil, Pulau Bukum, Pulau Merlimau, Pulau Pesek, Pulau Seraya, Pulau Tekong, Pulau Ubin, Sarimbun Reservoir, Sebarok Channel, Selat Johor, Selat Pedan, Sentosa, Serangoon Harbour, Singapore Strait, Sungai Johor, Tekong Reservoir and Tengeh Reservoir. Singapore has natural resources which include fish and the country's deepwater ports. There are no natural hazards listed in CIA - The World Factbook for Singapore. Environmental issues for Singapore include: limited natural fresh water resources; industrial pollution; limited land availability, which presents problems with waste disposal. In addition, there is seasonal smoke and haze, which is a result of the forest fires in Indonesia.